ContentTools is one of a collection of libraries designed for building tools that make it easier to edit HTML content. The ContentTools library provides a fully functional page editor which is the subject of the Getting started guide. However if you're interested in customizing the editor, extending the libraries or have something different in mind for the code then check out the Tutorials and API sections. The libraries themselves are written using CoffeeScript and SASS and ideally you'll want to roll your own for each web project. The build process is managed by grunt and is very simple, however to get started there's no need. If you're more the sort to learn by pulling code apart, there is a full demo of the editor complete with example content included in the /sandbox folder. If you are using Firefox then you may experience an issue where the icon font (icon.woff) doesn't load on your local machine. A reason for this along with a solution to the issue can be found on stackoverflow. The data-name attribute is used to identify the region when saving (by default the id attribute is used but I prefer to keep the editable markup separated from the existing HTML markup). We scope the alignment styles to apply to elements within [data-editable] regions. The CSS styles we want users to be able to apply to elements. The regions of the page we want to be editable. A mechanism for saving our content. We might also configure an image handler but that's for a later tutorial. Much like a word processor, it's possible to configure a list of predefined styles for your content. These then appear when the user selects a tag from the inspector bar at the bottom of the viewport. 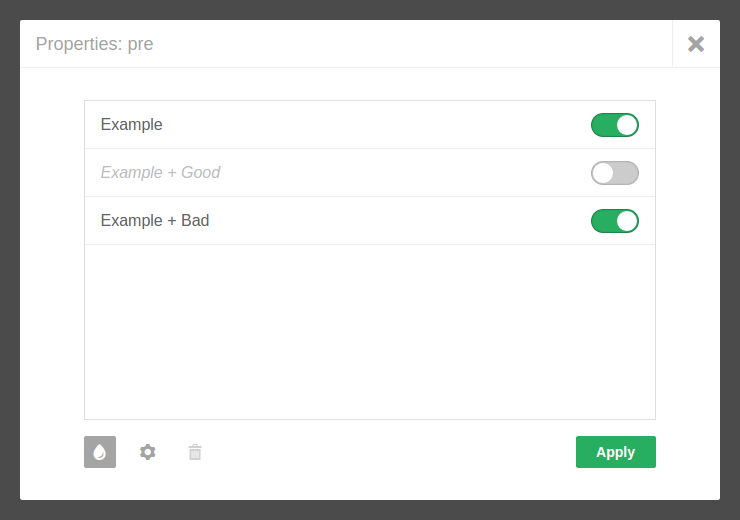 Only styles applicable to the tag type are displayed, though styles can be set to be applicable to all tags. We initialize the editor with a CSS selector for the editable regions of the page and an attribute name ('data-name') to tell the editor which of the element's attributes contains its region name. Region names must be unique within the same page. Finally we want to be notified when the user saves the page so that we can store the updated content of each region in a file or on a database. To do this we listen for the saved event to be triggered by the editor. Add the following code to editor.js after the editor.init statement. We're using AJAX to send the content of each region to the server when the user saves the page. How that content is saved is a decision for you, but the Saving strategies tutorial presents a couple of approaches that might be a useful starting point. Providing the user with some feedback is nice and so we set the editor to its busy state while we wait for a response from the server. In its busy state a spinning cog will appear to let the user know that something's happening. Once we get a response, a flash is used to notify the user of the success/failure of their save request. Flashes appear large and central for a short period; the ok flash displays a tick and no a cross. That's it; open your page in a browser, look for the blue edit button top left and click it to start editing. If you do get stuck don't forget there's a full demo included in the /sandbox folder of the ContentTools repo you downloaded. For a bit of user guidance the demo page is a good place to start.